There have been three main players in the recent and growing interest in developing improved varieties of the native Australian citrus. Erika Birmingham runs a 'bushtucker' nursery in New South Wales, and over many years has collected seed and propagating material from wild populations of Microcitrus australasica, the Finger Lime, and trialled different selections. She has been granted Plant Breeders Rights over the selection of the red Finger Lime she has named 'Rainforest Pearl'. Dr.Stephen Sykes, working for CSIRO in Victoria, was initially carrying out research on the uses of native citrus in citrus breeding programmes. He hoped to incorporate some of their desirable characteristics into commercial citrus varieties and rootstocks. However, it was realised that some of the hybrids he had created were of interest in their own right. Together with Andrew Beale (Australian Native Produce Industries), the varieties 'Outback Lime', 'Sunrise Lime' and 'Blood Lime' have now been propagated in large numbers, distributed to commercial growers in Australia, and are just starting to produce crops. There is, however, controversy over the granting of Plant Breeders Rights to some of the varieties described on this page. This is, I believe, based on the fact that some are simply selections from the best plants that have been growing in the wild. It is argued that these are not newly bred varieties, and were probably known about, and used, by Aboriginal people over many years. Click here for a flavour of these debates. One of the consequences of granting Plant Breeders Rights in Australia, is that it becomes illegal to export the varieties. Thus these plants are not available elsewhere. 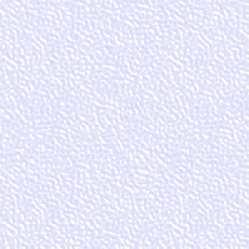 However, there is no reason why similar hybrids cannot be developed. Certainly, this has already been done in USA. Click here for details. Also, export of open-pollinated seeds are not controlled, and such seeds are quite likely to produce similar plants. I myself am attempting to make some crosses between the red Finger lime and other citrus. It is a long term project! These varieties are not currently available in the UK or USA. Most photos on this page are reproduced from Australian sources. Note that this page was written in 2005, when interest in Australian bushfoods was just starting to increase. Several of the original Australian government organisations no longer exist, or have changed their names and functions. Links to them will fail. There were three fact-sheets produced by CSIRO about these limes. The oldest one, dating originally from 2001, is the most interesting. However, please note the details given of the cold-hardiness of Eremocitrus glauca are incorrect. This is a selected seedling of Eremocitrus glauca (Citrus glauca), also known as the desert lime. The selection was made on the basis of the fruit size and yield, and growth habit, from propagating material collected from all over the natural range of the species. Fruits are about 2cms across, pale green to yellow and said to be juicy, sour but not bitter. This is an open-pollinated seedling hybrid, so the precise parentage is open to some doubt. However, it is believed to be a cross between an Ellendale mandarin (itself a mandarin x orange hybrid) and the red-fleshed Finger Lime. The red colour of rind, flesh and juice, is said to vary with different growing conditions. The fruit's internal flesh does not consist of the round globules found in the Finger Lime. Taste is described as 'sour'. 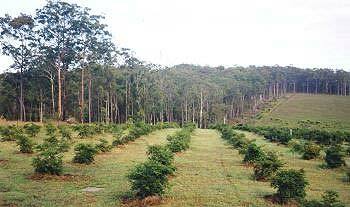 There are approximately 1000 Blood Lime trees, propagated by ANPI, planted at Pipers Creek Grove, Dondingalong, near Kempsey, New South Wales. About 4 years old in 2005, the trees had already produced a commercial harvest for fresh and frozen sales. This is again an open-pollinated seedling selection. 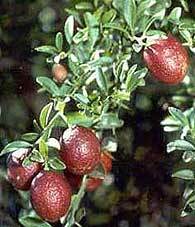 The parent fruit was a Faustrimedin (Finger Lime x Calamondin), a hybrid first made in the USA. The yellow, pear-shaped fruit can be eaten whole. They are said to have "a sharp, clean flavour with a light 'floral' aroma". A selected variety of Microcitrus australasica v. sanguinea, the red-fleshed Finger Lime. "This small evergreen tree has a tall, narrow, open form and is usually 4-6m in height. Foliage is dark, glossy-green with a purple flush of new growth. Flowers are small, white and fragrant, occurring in Spring and the trees are bird and butterfly attracting. Fruits are 'fingershaped' and sized, ripening in Autumn. The skin of the fruit ripens from purple to green and the mature pulp colour is green to pink. Compressed within the fruit are separate rounded pulp-vesicles which burst out like 'pearls' or caviar, when the limes are sliced open." 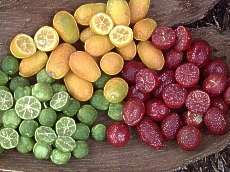 In 2005 I contacted a new Australian company hoping to succeed in the commercialisation of their selections of different coloured finger limes. 'Finger Limeing Good' originally named its selections Mebbin Green', 'Black Banger', 'Purple Passion' and 'Luscious Lemon'. Now their varieties are registered as Limeburst� opaque, Limeburst� green, Limeburst� pink, Limeburst� burgundy and Limeburst� yellow. Click here for more details. and I own the web address www.fingerlime.co.uk ! !